There is something magical about New Year’s Eve and we all want to look our absolute best. So, what are we going to do when that inevitable spot or shaving nick happens to ruin our party perfect look? 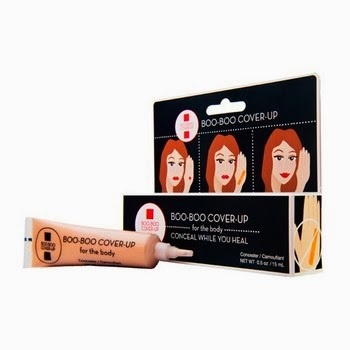 Well, The Makeup Examiner found the most amazing product, Boo Boo Cover-Up! Necessity being the mother of invention, Brandy Jans created Boo Boo Cover-Up when she found herself attempting to treat nasty bug bites. The bites were easily treated with first-aid ointment, but this still left icky red marks all over Brandy’s legs. Boo Boo Cover-Up is meant to both treat and conceal a plethora of skin issues including the ones that we inadvertently inflict upon ourselves such as bumps from waxing and shaving. To use the product, you simply dot and blend a small amount over the affected area. Oh, getting back to the uses for Boo Boo Cover-Up, if it’s skin related you can count on this very special concealer. Made from ingredients including aloe, chamomile, green tea and vitamin E, beyond the obvious pluses of this product, the company itself gets a win for being a woman-owned business, made in the USA and cruelty-free. Boo Boo Cover-Up ($19.99 USD) is available at the brand’s webiste and select retail locations.